The pay of a junior-level worker at its Shenzhen plant in China grew to 1,800 yuan per month, and could even go beyond 2,200 yuan if the worker passes a technical examination, according to Reuters. That's significantly up from the pay of 900 yuan from three years ago. 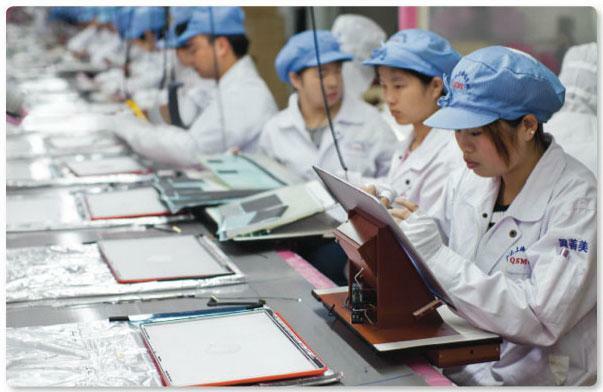 Foxconn's pay increase should go even further to calm concerns over wages and working conditions at the factories, which assemble iPhones and iPads along with electronic devices from many other device makers. The announcement from Foxconn comes only days after the Fair Labor Association began inspecting its facilities as part of an independent audit requested by Apple. The FLA said after its initial visit that Foxconn's iPad manufacturing plant is "first class," with conditions far better than garment factories in China. Foxconn last boosted employee wages in June 2010 following a rash of suicides that occurred at the company's massive mega-factory in Shenzhen. The manufacturer said Friday that the basic salary of its junior workers is already "far higher than the minimum wage." "We will provide more training opportunities and learning time, and will continuously enhance technology, efficiency and salary, so as to set a good example for the Chinese manufacturing industry," the company said in a statement. Foxconn and Apple have come under great scrutiny since stories from The New York Times and CNN highlighted purported labor issues in Apple's supply chain. The Times article suggested that Apple has known about those issues in its supply factories for years without requiring that they be addressed, but Apple Chief Executive Tim Cook shot back in an e-mail to employees, calling those claims "patently false and offensive." Apple announced in January that it had joined the Fair Labor Association, becoming first technology company to do so. Its participation in the FLA means that Apple agrees to have the association independently assess facilities in its supply chain and report detailed findings on its website.